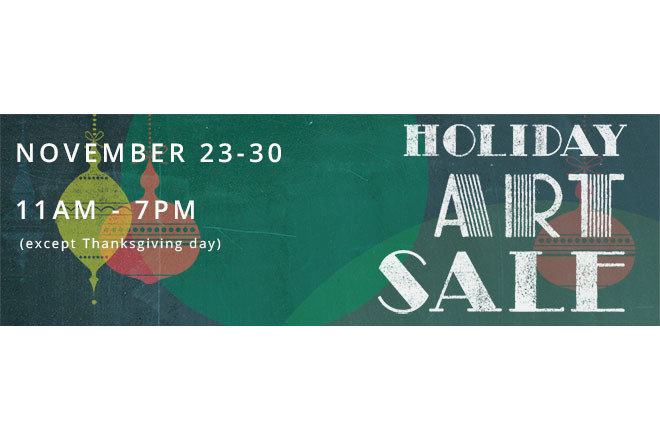 SEATTLE, WA - Pratt Fine Arts Center invites holiday shoppers and art enthusiasts to purchase unique artwork at its popular Holiday Art Sale this November. This event features a selection of unique fine art gifts, including works by local established and emerging artists in a variety of mediums including glass, jewelry, wood, sculpture, painting and print. The sale will be held in Pratt's Printmaking, Drawing and Painting Studios. Pratt will host an exclusive Opening Night “First Dibs” Party on November 22 from 6-9pm before the Holiday Art Sale opens to the public. Opening Night attendees will have the exclusive opportunity to view and purchase artwork before it goes on sale to the public, as well as the rare ability to purchase unsold work from previous Pratt auctions and other special events. This year the Opening Night “First Dibs” Party will include an exciting hands-on art making experiences with a holiday twist. Admission to the “First Dibs” Party is $50 and guests may register online at or at the door. Appetizers and libations will be provided for holiday merriment! The Holiday Art Sale is an excellent venue for art lovers to find one-of-a-kind gifts for their friends and family members, while supporting local artists and Pratt Fine Arts Center. Sixty percent of the proceeds from the sale go directly to the artists, while forty percent provides support for Pratt's classes and programs. The sale is free to attend and open to the public.